The Chicago Tribune writes: "Moving among styles ranging from Lutheran hymnody to blues to Broadway, this modern-day Passion will move many listeners to tears even as it reaches beyond tragedy to peace, understanding and forgiveness." 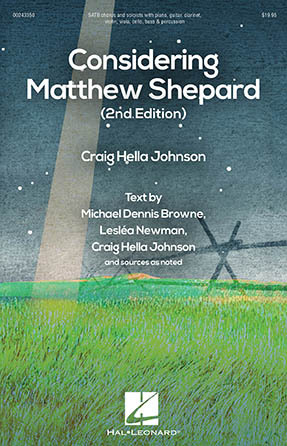 On the eve of the 20th anniversary of this tragic event, Craig Hella Johnson has written a modern fusion oratorio incorporating a variety of musical styles along with texts from Rumi, Hildegard of Bingen, Leslea Newman, and Michael Dennis Browne as well as excerpts from Matt's journals, interviews with his parents, and newspaper reports. For the advanced choir looking to make an impact on students and community, this is worth every bit of effort it requires. One of the most important major works of our time.